Of all the film franchises that have sprung up recently here in the U.S., “The Hunger Games” is not one of those franchises I’m really invested in. Personally, there are just certain elements of the storyline that tend to break my suspension of disbelief from time to time. Bear in mind, this is based on what I’ve seen in the films and not on the Suzanne Collins novels. I’m also just tired of the fact that I’m constantly being told how the franchise is the next “Twilight” or “Harry Potter,” when the basic elements of the story don’t have as broad of a scope of appeal as those other franchises. I won’t deny that it has a good pair of legs, but the marketing and merchandising of “The Hunger Games” is focusing on all of the wrong things. That’s a topic that could be an article in and of itself, but marketing woes aside, how does the latest cinematic entry to the franchise hold up? Is it truly “Catching Fire,” or is it merely smoldering like a tiny piece of charcoal, with its few embers generating heat, but no spark or flame? “Catching Fire” picks up after the events of the previous film as we follow Katniss Everdeen, reprised by Jennifer Lawrence, who’s suffering from PTSD as a result of taking part in the Hunger Games one year prior. Since then, she’s been living in the Victor’s Village with her mother and sister, while struggling to maintain the illusion of the relationship between her and Peeta, reprised by Josh Hutcherson. Since their victory in the Hunger Games has sparked rebellion in the districts of Panem, President Snow, reprised by Donald Sutherland, decides to “get rid” of Katniss by having the 75th Hunger Games, known as the Quarter Quell. Tributes from the previous victors of the Hunger Games from each respective district are chosen to compete, because antagonizing citizens is a full-proof way to quell rebellion, apparently. This film doesn’t really appear to have all that much going on in terms of depth. Many moments in the story that are supposed to be hard-hitting feel almost a tad brushed over due to the large amount of ground it has to cover. That’s not to say that the film is without its good ideas and moments, but it suffers from many of the same problems that movies based on books have, where so much is condensed into one film for the sake of staying faithful. A lot of that is also reflective in the parts of the film both prior to the Games and in the final moments, as they both feel incredibly rushed. It doesn’t take time to really explore some of the consequences and after-effects of the previous film, and what we do see, feels like the film is just going through the motions. From a technical standpoint, the editing was odd in a few places throughout the film, but the biggest offender lies in the cinematography of the night-time scenes. I understand that it’s going to be dark at night, but I was putting strain on my eyes trying to make out what was happening, especially when we see the characters trying to deal with various threats in the arena. As a whole, fans of the franchise may enjoy it, but as a film it was kind of boring and felt, hollow. While some of the revelations made at the end of the film explain the overall style, the biggest problem is that the story we’re following as an audience isn’t really interesting enough to keep one’s attention unless they’re already a die-hard fan. While its predecessor had its fair share of flaws, it at least had clear pacing, whereas this film is muddled at best as it suffers from “middle syndrome” that’s often seen in trilogies and multipart sagas of television series, where the purpose of a particular installment is to get you from one major part of the story to another without calling too much attention to itself. It’s decent I guess, but it doesn’t really surpass previous film and isn’t worth the full ticket price. 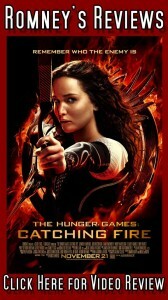 “The Hunger Games: Catching Fire” gets a 3.5/5.